The Conan Doyle oeuvre is well trodden by theatre makers, particularly in the wake of the successful Warner Bros. franchise and BBC series catapulting Holmes back into the forefront of popular culture. One might argue that it’s roundly difficult to do something new, but what Tacit Theatre have instead aimed for is not to reinvent the wheel, but to revisit the alchemy of character and curiosity that first made the world’s only consulting detective so famous. 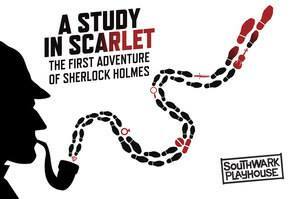 Rather than dallying with gimmicks and knowing nods and references to the now dizzyingly extensive array of representations of Holmes, A Study in Scarlet strips the story back to its original form; an interesting mystery with real people and a flamboyantly arrogant genius at its heart. There is an unspeakable pleasure in having Holmes (Philip Benjamin) play the violin himself not ten feet away from you – a skill that is understandably often worked around rather than sought out in casting – and the interweaving of live music (as played by the majority of the cast) with alternate scenes from the Utah backstory bring an enjoyable cantering pace to the production and the opportunity for the audience to both understand and empathise with the backstory of Jefferson Hope (Elliot Harper) and Lucy Ferrier (to which newcomer Stephanie Prior brings admirable pathos), which Conan Doyle himself only revealed at the end of the novel. Edward Cartwright is enjoyable as the affable and oft baffled Doctor Watson, and both he and Benjamin return the duo to the utterly camp delight of earlier iterations – shrugging off the sometimes too self aware and self congratulatory habits of modern adaptations that can lead the humour to fall flat; it succeeds here precisely for concerted lack of trying. Katharine Heath’s warm and shabby set provides the ideal 221B, with Holmes bustling and clambering all over it to tinker with his scientific equipment and a somewhat recalcitrant attendant Mrs. Hudson (Holly Ashton) lends satisfying completion. Tacit have additionally gone to great pains to explore the source material – with podcasts exploring not only the history and mythology of the Holmes stories but also the background of the Danites; the extreme Mormon sect depicted by Conan Doyle (somewhat controversially even at the time) in his original novel. All told, this is such a well thought out, tidily presented production and such a deliciously fun night out that it feels impossible not to recommend it to everyone!